The New Day came out on an apparatus that turned into a magic carpet for them to ride to the ring. Sheamus and Big E started out. Big E had contorl early and tagged out to Kofi. Sheamus worked over Kofi and tagged out to Cesaro. Kingston caught him with a dropkick for a two count. Kingston was worked over for a long time as the Champions tagged in and out. He tried to fight to make a tag out to Big E but Sheamus cut him off and drilled him with hard shots to the chest. Kingston was kept down on the mat by Cesaro but strove to get to the corner. They got close to Big E but Cesaro nailed E with a cheap shot. Kingston finally backdropped Cesaro who tagged Sheamus. Sheamus knocked Big E off the apron before Kofi could make the tag. Cesaro tagged back in and they nailed a double-team Jackhammer for a two count on Kingston. 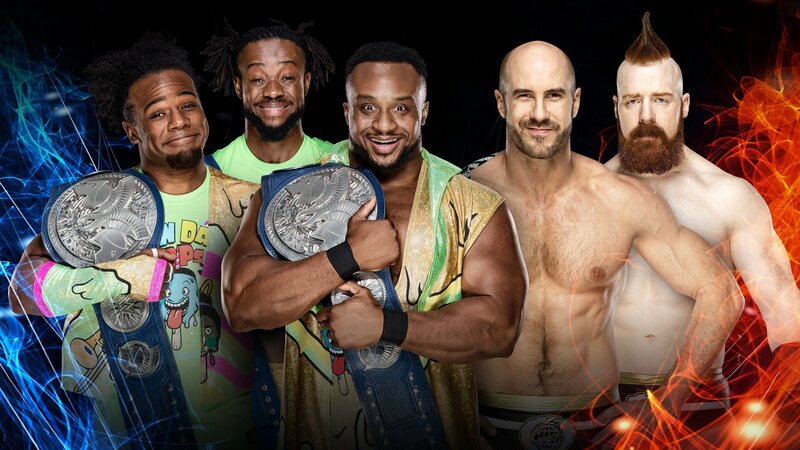 Big E finally makes the hot tag. He nailed a big splash and a big uranage for a two count. He went for the spear through the ropes to the floor but Cesaro nailed him with a knee to the face. Sheamus tagged in and pounded him with right hands. E lifted Sheamus on his shoulders and Kofi came off the ropes with a double stomp on his back while he was on E’s shoulders. That was creative. Kofi hit Trouble in Paradise on Cesaro. They went for The Big Ending but Sheamus kicked up. Show got on the apron and argued with the referee. E was sent into Show, who hit the KO punch, which the referee missed. Sheamus hit the Brogue Kick and scored the pin. 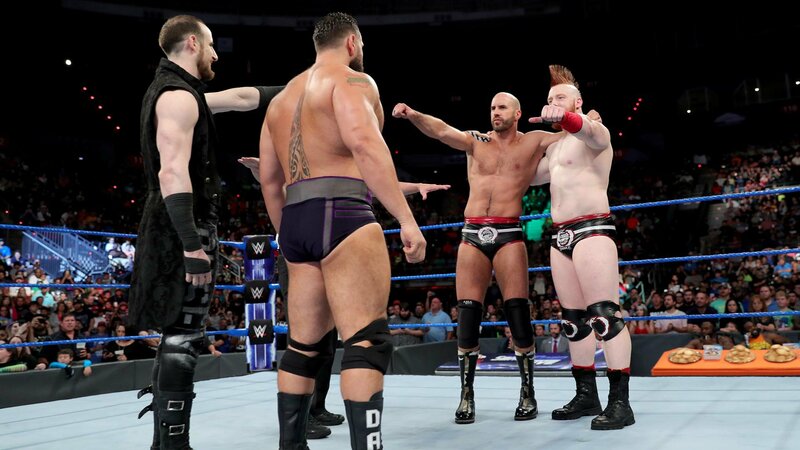 Your winners and still WWE Smackdown Tag Team Champions, The Bar! Cesaro and Kofi start things out with some basic wrestling 101. Kofi lands a clothesline and tags in Woods, who hits an elbow drop off the middle rope then takes out Sheamus. Kofi with a springboard splash twice for 2. Cesaro and Sheamus roll out of the ring to regroup until Kofi went for an outside dive but was caught and sent into the ring post. The same went for Woods. Back in the ring where the challengers caught Kofi with a double kick and clothesline. The challengers beat down Kofi for a few minutes with double team moves and quick tags to gain the advantage. Sheamus missed a clothesline and Cesaro caught Kofi with an uppercut then landed a backbreaker for 2. Moments later, Kofi fought back with a series of strikes and backdropped Cesaro over the top rope to the floor. Woods got the hot tag and hit Cesaro with a superkick. Woods with a low kick to Sheamus then a DDT for 2. Woods with a head kick to Sheamus, who later reversed a move into a backbreaker for 2. Sheamus missed the big boot and Woods rolled him up for 2. Cesaro was tagged in and hit Woods with a major league uppercut for 2. Cesaro went swinging with Woods several times then locked in the sharpshooter until Kofi kicked Sheamus away and broke up the submission. Kofi took Sheamus out of the ring while in the ring, Woods rolled up Cesaro for 2. Cesaro rolled him up and used the ropes but only got 2 thanks to Kofi. Woods with a big boot then the New Day hit their tag team finisher for the win. Sheamus with a side head lock and he connects with forearms across the chest on the apron. Big E hip tosses Sheamus over the top rope to the floor. Big E sets for a splash on the apron and he connects. Big E is given a pancake “smelling salt” to get a second wind as we go to commercial. We see Sheamus and Cesaro in the back and they are talking strategy. Kramer Kingsmen is trying to interview them but before he can finish his monologue, they have made their way to the ring. Cesaro and Aiden start things off and they lock up. Aiden goes to the floor. They lock up again and Aiden with a side head lock. Cesaro with a shoulder tackle. Aiden with a Japanese arm drag and then he sends Cesaro into the turnbuckles. Rusev is tagged in and Aiden with a hip into the corner and Rusev with a clothesline for a near fall. Rusev with a punch and shoulders in the corner. Cesaro with a knee and he tags in Sheamus. Sheamus goes for a suplex but Rusev blocks it. Rusev with a suplex and he gets a near fall. Rusev with an elbow drop and then he applies a front face lock. Rusev with a punch but Sheamus with a clothesline for a near fall. Cesaro tags in and hits a European uppercut and then slams Rusev. Cesaro with a reverse chin lock. Sheamus tags in and he applies a reverse chin lock. Rusev escapes and he connects with a boot. English tags in and he hits a cross body and follows with punches. English with a kick and snap neck breaker. Sheamus goes for a belly-to-back suplex and English lands on his feet. 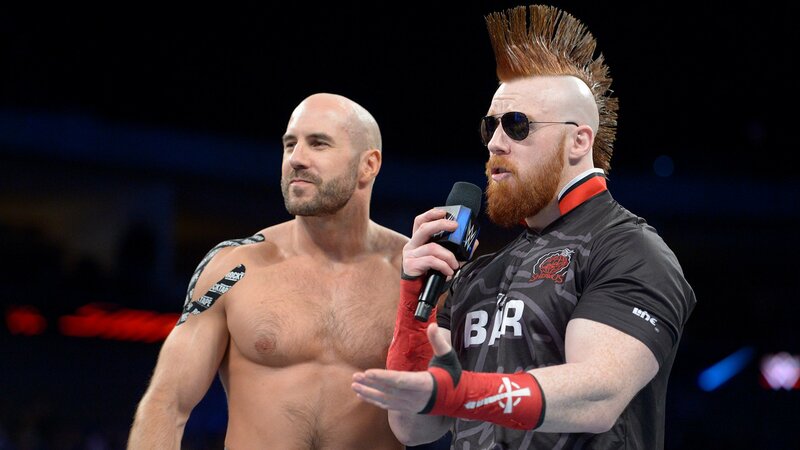 Sheamus goes to the floor and so does Cesaro. 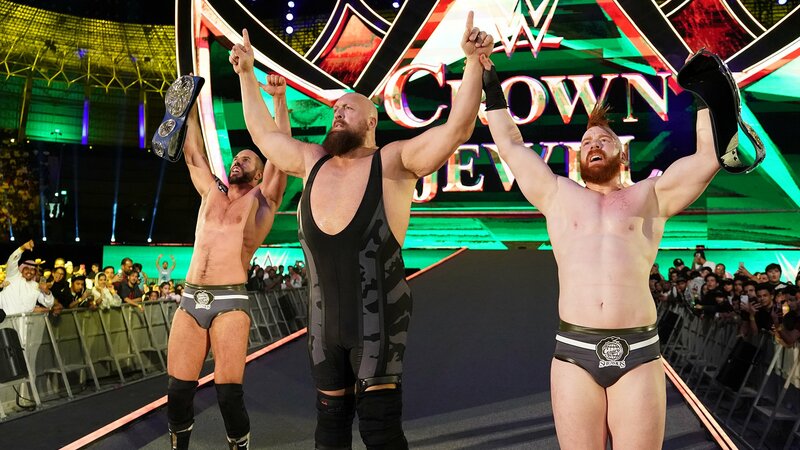 Rusev tags in and he sends English over the top rope onto Sheamus and Cesaro. English with a DDT for a near fall. Cesaro tries to interfere but English sees him coming. Sheamus with a knee to English to knock him off the apron. Cesaro tags in and he connects with a European uppercut. Cesaro throws some pancakes before getting back into the ring. Cesaro with a European uppercut and he tags Sheamus back in. They kick English and Sheamus with a clothesline for a near fall. Cesaro tags back in and he kicks English and applies a reverse chin lock. 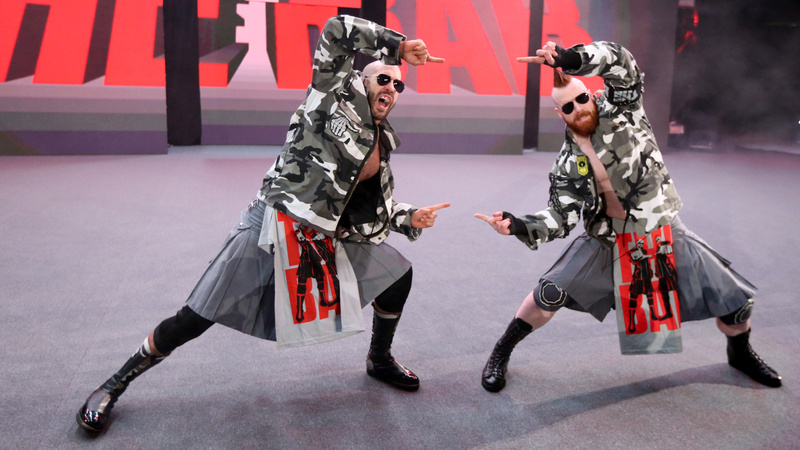 We are back and Sheamus with a back breaker to English but Aiden gets to his feet and he connects with a jaw breaker. Sheamus charges into the corner but misses English and Sheamus hits the ring post shoulder first. Cesaro and Rusev tag in and Rusev with a shoulder tackle and round kick. Rusev with a running hip into the corner followed by a spinning heel kick. Rusev with a pop up knee to the midsection and he gets a near fall. Rusev applies the Accolade but Sheamus breaks it up. Rusev sends Sheamus to the floor. Rusev runs into a European uppercut and Sheamus tags in. They hit a double elevated DDT for a near fall. Sheamus sends Rusev into the turnbuckles but Rusev escapes and he gets a near fall with a rollup. Sheamus with a power slam for a near fall. Sheamus sets for the Brogue Kick and Aiden pushes Rusev out of the way and takes the Brogue Kick. Rusev with a Machka Kick for the three count.